Exposure to environmental contaminants can produce profound effects on the immune system. Many classes of xenobiotics can significantly suppress or enhance immune responsiveness depending on the levels (i.e., dose) and context (i.e., timing, route) of exposure. Although defining the effects that toxicants can have on the immune system is a valuable component to improving public health, environmental immunology has greatly enhanced our understanding of how the immune system functions and has provided innovative avenues to explore new immunotherapies. This Brief Review focuses on three examples of how immunotoxicology has benefitted the field of immunology, presenting information on the aryl hydrocarbon receptor signaling pathway, the immunomodulatory effects of nanomaterials, and the impact of xenobiotic exposure on the developing immune system. Collectively, contributions from immunotoxicology have significantly enhanced public health and spurred seminal advances in both basic and applied immunology. It is widely accepted that human health is a product of both genetics and the environment, a premise that also holds true for the immune system. Although our genetic make-up is essentially set at birth, the environment that we experience is constantly changing, presenting novel challenges in the development, regulation, and function of immunity. Assessing the consequences of exposure to environmental compounds within the immune system is not a straightforward process. Toxicants can enter the human body through four primary routes: inhalation (respiratory tract), ingestion (gastrointestinal tract), dermal contact (skin), and parenteral (circulation/muscles) as a result of intentional or accidental exposure (Fig. 1). Therefore, the study of how xenobiotics influence the immune system, also known as immunotoxicology or environmental immunology, is a critical component of immunology. Understanding how environmental contaminants impact immune responsiveness not only helps in the effective regulation of pollutants and improving public health, it provides novel insights into basic functions of the immune system. Therefore, the intent of this article is not to present an overview of the immunotoxic effects of environmental toxicants as it pertains to human health (because this information is much too extensive for a Brief Review) but instead to emphasize recent contributions that environmental immunology has made to advance the field of immunology. Consequently, this Brief Review focuses exclusively on three cutting-edge areas of research that are providing critical insights into basic immune function, the effects of environmental compounds on immune function, and the development of potentially novel immunotherapies. Exposure to and effects of environmental toxicants. Toxicants may access the human body through four points of entry (skin, blood, respiratory, and digestive tracts), as shown in blue, and affect numerous organs, including the immune system. Toxicants interact with the immune system as a result of deliberate or unintentional exposure, causing either immune activation or immune suppression. Depending on the disease context, this may be either beneficial or detrimental because undesirable immune activation or immune suppression may result in adverse health effects. Although multiple scientific advances coalesced into the discovery of the aryl hydrocarbon receptor (AhR), a common theme existed among them: the necessity to understand mechanisms of xenobiotic toxicity. Specifically, the observation in the 1970s that polycyclic aromatic hydrocarbons appeared to induce their own metabolism drove the ultimate discovery of a receptor that could bind these compounds (1–3). A prodigious contribution to AhR research came with the discovery that 2,3,7,8 tetrachlorodibenzo-p-dioxin (TCDD), a halogenated aromatic hydrocarbon and ubiquitous environmental contaminant, could bind AhR and, in fact, could do so in mammalian hepatocytes with 30,000 times the affinity of other environmental compounds, including polycyclic aromatic hydrocarbons (4). With this discovery, AhR research and its impacts across multiple physiological systems, including immunology, were just beginning. In the years following identification of AhR, characterizing its expression in nonhepatic tissues became a key focus. In 1984, thymic expression of AhR in Sprague-Dawley rats was determined to occur at high levels for twice as long (42 d versus 21 d) after parturition compared with nonimmune tissues, such as liver and lungs (5). These observations led to further investigation of AhR activity in immune organs and the pivotal discovery that AhR activation had adverse effects on thymic function. In 1985, PCBs acting through AhR were found to cause severe thymic atrophy and humoral immune suppression (6). The succession of rapid discoveries throughout the 1980s broadened the expanse of AhR-mediated suppression within the immune system to include thymic atrophy, reduced cell-mediated immunity, diminished humoral Ab responses, and an overall reduction in the ability to respond to and resist infectious diseases (5–9). With a potential link made between AhR and observed suppression of the immune system, immunologists entered into the field, which to this point had predominantly been pioneered by toxicologists and biochemists. The interweaving of discoveries from these disciplines expanded our understanding of the AhR signaling pathway and its role in innate and adaptive immune responses, as recently reviewed by Stockinger et al. (10). Because several recent reviews focused on AhR activation in T cells, our focus is on what we consider three key areas of ongoing investigation: the role of AhR in the innate immune system, the crusade to identify endogenous ligands, and the development of novel AhR-mediated immunotherapies. 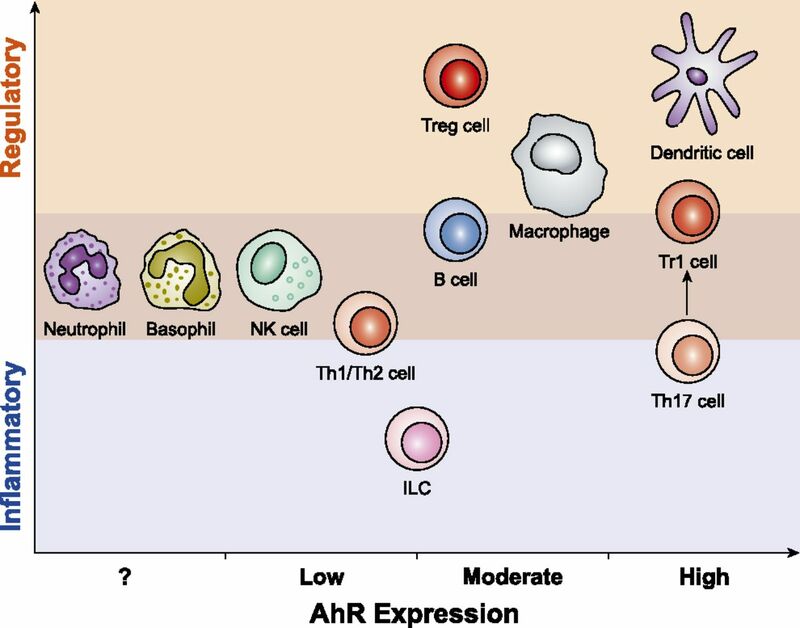 Innate immune cells vary widely in their expression of AhR (Fig. 2), ranging from high, constitutive expression to low, conservatively inducible expression. It should be noted that most reports describing AhR expression in immune cells rely solely on mRNA levels and not protein expression, representing a potential important gap in information as recently highlighted by Esser and Rannug (11). The outcome of AhR activation on the promotion or regulation of immune responses appears to vary by cell type and maturational state. Interestingly, both inflammatory and regulatory genes have an abundance of AhR-responsive elements (dioxin response elements or xenobiotic response elements) within their promoter/enhancer regions (12, 13), and it was shown that cross-talk between AhR and NF-κB can significantly impact multiple proinflammatory signals (14). Neutrophils, as well as most granulocytes, do not express AhR at significant levels and appear to be predominantly influenced by AhR activation through indirect mechanisms (15). AhR expression in immune cells. AhR expression (x-axis) and outcomes of AhR activation (y-axis) by immune cell type. Professional APCs (e.g., macrophages and dendritic cells [DCs]) constitutively express AhR at relatively high levels and play a significant role in AhR-mediated immune suppression. AhR activation in DCs increases the expression of regulatory genes, including IDO-1 and IDO-2 (Ido1 and Ido2), retinaldehyde dehydrogenase 1 (aldh1a1), and TGF-β3. Consequently, AhR-activated regulatory DCs can be potent inducers of Foxp3+ regulatory T cells (16–20). In contrast, AhR functions as a regulator of innate/inflammatory responses in macrophages, as illustrated by the negative regulation of LPS-induced inflammation and subsequent enhanced sensitivity to lethal shock (21). Also, AhR activation in monocytes/macrophages results in dysregulated cytokine and chemokine production, a consistent effect observed in murine and human cells (22, 23). Lastly, the differentiation and/or maturation of monocytes/macrophages and DCs is affected by AhR, an effect that contributes to immune dysregulation (24–26). Human NK cells, which express AhR in stage 3 immature NK cells and “NK-22” cells, play an important role in innate immune responses to mucosal infections that may be altered by environmental AhR ligands (27, 28). Indeed, AhR regulates cytolytic activity in murine NK cells, as represented by reduced bacterial clearance, and tumor cell recognition capacity in AhR-null mice. These studies also suggest that NK cell function is potentiated following AhR activation (29). Conversely, other reports demonstrate that AhR activation can suppress NK cell function, suggesting that additional environmental or maturational components may also contribute to AhR-mediated effects in NK cells (14). Likewise, innate lymphoid cells (ILCs), which play an important role in mucosal immunity, were shown to have compromised bacterial clearance and reduced IL-22 expression when they lack AhR (30). Although investigations into the role of AhR in ILCs are relatively recent, existing studies indicate AhR activation in ILC subsets effectively regulates transcriptional activation and, consequently, the clearance of mucosal infections, immune tissue development, and regulation of chronic inflammatory diseases, such as inflammatory bowel disease (31). Collectively, AhR plays a prominent role in the development and function of the innate immune system, and future studies are warranted to further elucidate the health implications of this relationship. Because the most well-studied AhR ligands are ubiquitous environmental pollutants, studies aimed at defining the impacts of AhR activation within the immune system often have had dual roles: to identify the immunomodulatory effects of AhR signaling in immune cells and to assess the breadth of immunotoxicity following exposure to large classes of xenobiotics. Early discoveries by toxicologists and biochemists provided several decades of highly insightful AhR research within the immune system. However, now that AhR research has gained considerable traction among immunologists, future studies on this ligand-activated transcription factor are expected to continue to bolster our understanding of immune function and regulation. To this end, the recent discovery of putative endogenous AhR ligands yielded several compounds that can bind and activate AhR with relatively high affinity (32). For example, 2-(1′H-indole-3′-carbonyl)-thiazole-4-carboxylic acid methyl ester (ITE) from porcine lung tissue (33) and the tryptophan derivatives 6-formylindolo[3,2-b]carbazole and l-kynurenine are “natural” AhR-activating compounds that can significantly impact the generation of immunity (18, 34–37). However, although these chemicals activate AhR and can induce similar transcriptional responses to TCDD, such as the induction of signature cytochrome P450s (CYP1A1, CYP1A2, CYP1B1), they are highly susceptible to metabolism by these xenobiotic-metabolizing enzymes, thereby limiting their effective half-life and associated toxicities (37). At present, at least one of these compounds (ITE) is being evaluated for potential therapeutic use in humans (discussed below). Notably, we have a limited understanding of the specific biomolecular interactions that occur between ligands and AhR as the result of the lack of a defined crystal structure for this receptor. Therefore, it is difficult to accurately predict what the clinical outcomes will be if/when AhR-binding compounds are eventually tested in humans, who are generally considered to express a 10-fold lower-affinity AhR compared with (most) rodents. This relationship remains to be confirmed in significantly larger human cohorts, thereby representing a prominent gap in our understanding of AhR biology. With AhR now recognized as a potent immune regulator, it has become an attractive target for immunotherapy. However, there are many factors that must be fully considered when intentionally targeting AhR to achieve specific immune regulation. It is well documented that the effects of AhR activation during an immune response vary based on the target cell (10, 11, 32, 37). AhR activation can increase inflammatory responses or, alternatively, promote immune regulation or tolerance (38). Recently, nanoparticles (NPs) containing ITE, an AhR agonist, were used successfully to treat experimental autoimmune encephalomyelitis (EAE), a mouse model of multiple sclerosis. In these studies, gold NPs (AuNPs) were used for parenteral delivery of ITE and an antigenic self-peptide, myelin oligodendrocyte glycoprotein 35–55 (39). Within 6 h of administration, splenic DCs, which internalized ITE-loaded NPs, significantly upregulated AhR-responsive genes, including aldh1a1 and cytochrome P450 1a1, the prototypical AhR target gene. Ultimately, a marked reduction in EAE disease scores was observed following administration of ITE-loaded and ITE/myelin oligodendrocyte glycoprotein 35–55-loaded NPs, an outcome that was attributed to a significant induction of disease-specific regulatory T cells (39). Although parenteral administration of AhR agonist–loaded NPs (AhR/NPs) showed significant amelioration of EAE in mice, AuNP uptake was not isolated to DCs in these animals; it was observed in several immune and nonimmune cells (39). Because unguided NPs can often yield off-target adverse effects, we hypothesize that using delivery systems that directly target specific immune cells, such as DCs, will increase the efficacy of AhR/NP therapy, lower the concentration of AhR/NPs necessary to reach therapeutic levels, and reduce or eliminate potential adverse responses that may occur from nonspecific uptake of AhR/NPs by bystander cells. Ultimately, intentional modulation of AhR holds great promise for the development of novel immunotherapeutics to treat patients suffering from multiple sclerosis and potentially other devastating immune-mediated diseases. Nanotechnology represents the merging of science, engineering, and technology at the next great industrial revolution: control of matter at the nanoscale. At this level, matter exhibits unique physical, chemical, and biological properties, which differ from the canonical properties of bulk materials and single atoms or molecules. These unique properties, although enabling novel applications and technological advances, also give rise to safety concerns that cannot be ignored. Several of those same characteristics that make nanomaterials (NMs) so promising from a technological standpoint, also make their interactions with biological systems difficult to anticipate and critically important to investigate methodically. Over the last decade, researchers from industry, academia, and federal agencies have been collaborating to establish specific assays and NMs criteria that will assess the impact of NMs on immune function. Currently, no comprehensive guidelines exist. Because NMs represent such physically and chemically diverse materials, classical immunotoxicological methods cannot always be applied, and novel approaches may be required to overcome challenges inherent to NMs research. For example, many NMs absorb in the UV–visible range and may even catalyze enzyme reactions or quench fluorescent dyes commonly used in end-point and kinetic assays. Similarly, although exposure to a particular NM may result in no change in immune function when delivered via the oral and dermal route, it may induce sensitization after intradermal injection. Lastly, risk to human health is not entirely linked to NM production volume and probability of exposure, but rather to reactivity and potency of impact on specific organs. Consequently, NMs produced in lower quantities that have potent and selective effects on the immune system (e.g., nickel, gold, and cobalt NM) may exhibit greater immunotoxicity. Thus, we must assemble a comprehensive understanding of the relationship between diverse NMs and specific components of the immune response resulting from different testing scenarios. As a result of NM size and unique properties, the immune system efficiently recognizes engineered NMs as foreign bodies, resulting in multilevel responses that can range from acute to chronic, and from immunostimulatory to immunosuppressive (40). Although NMs-induced immune activation may increase the incidence of allergic reactions, inflammatory responses, or autoimmunity, NMs-induced suppression may reduce maturation and proliferation of immune cells, resulting in increased susceptibility to infectious diseases or tumor growth. Although a desirable interaction between NMs and the immune system may lead to beneficial outcomes, such as vaccines or therapeutics for inflammatory and autoimmune disorders, an undesirable interaction may result in adverse outcomes, such as hypersensitivity reactions and inflammation, or lowered response to infection and cancerous cells. Moreover, inadvertent recognition of NMs as foreign by immune cells may result in host toxicity and/or reduced therapeutic efficacy of conventional pharmaceuticals. Carbon nanotubes are a family of NMs made up entirely of carbon. Within this family, multi-walled carbon nanotubes (MWCNTs) are of special interest to the industry because of their broad applications in electronics, cosmetics, cleaning materials, coatings, food packaging, and medicines. Concerns over MWCNT-induced toxicity have emerged, in part due to their high production volume, as well as their structural similarity to asbestos. Numerous studies have since scrutinized the effects of MWCNT length and diameter, purity, aspect ratio or rigidity, and functionalization in relation to in vitro and in vivo toxicity, inflammation, and fibrosis, particularly in the lungs (41–43). Numerous studies clearly demonstrate that MWCNTs induce lung injury through acute and chronic inflammation, granuloma formation, and substantial interstitial lung fibrosis, as well as exacerbate asthma-like conditions in mice (44–46). This section surveys recent efforts to define the effects of MWCNTs on the innate immune system. Once NMs deposit in the lungs, alveolar macrophages are responsible for their uptake and processing through phagocytosis, macropinocytosis, and clathrin/caveolin-dependent and -independent endocytosis (47–49). A number of studies similarly linked MWCNT-induced oxidant stress, phagolysosomal permeabilization, cathepsin B release, NLRP3 inflammasome assembly, and caspase-1 activation with secretion of important regulatory cytokines (e.g., IL-1β and IL-18) (50–55). Activation of the NLRP3 inflammasome by MWCNTs is consistent with reports showing that other inhaled particles (e.g., silica and asbestos) cause lung injury through NLRP3 inflammasome activation (56). Upon internalization, MWCNTs induce lysosomal dysfunction and autophagosome accumulation, which may disrupt autophagy (57, 58). In turn, disruption of autophagy may enhance NLRP3 inflammasome accumulation, resulting in exaggerated IL-1β production and lung fibrosis (59). Interestingly, variation in the dimensions and surface properties of NMs affects the autophagic responses of cells (60, 61). Similarly, variation in MWCNT surface structure activates alternate autophagy signaling pathways (mTOR dependent to mTOR independent) (62). Agents that can selectively induce autophagic cell death in tumor cells are promising tools to treat or supplement current cancer therapies. Thus, modulation of autophagy by NMs may be a potential therapeutic strategy. Taken together, these studies provide novel insights on how NMs, such as MWCNTs, contribute to inflammasome activation, autophagic cell death, and induction of the stress response, as well as the role of NM surface chemistry in the modulation of these signaling processes for therapeutic benefit. These findings are particularly relevant given that dysfunction or dysregulation of inflammasome activation and autophagy is associated with several immune-mediated diseases. Given the rapid growth of nanotechnology and the myriad potential physicochemical properties, NMs will influence and advance emerging medical technologies in both therapeutics and diagnostic applications. Scientists are engineering NM-based approaches to specifically target and/or circumvent the immune system. The resulting treatments may be more precise, may diagnose or treat disease earlier, and may exhibit fewer adverse side effects. Nanotechnology platforms are being investigated as vaccine carriers, adjuvants, and drug-delivery systems to target inflammation and inflammatory-associated disorders. Some formulations are already in clinical trials, whereas many others are in various phases of preclinical development. NMs-based delivery systems offer the following potential advantages: site-specific delivery of drugs, peptides, and genes; improved in vitro and in vivo stability; and reduced side effects. Although in recent years our understanding of NMs interaction with components of the immune system has improved, many questions remain. It is now well accepted that NM size, surface charge, hydrophobicity/hydrophilicity, and the steric effects of particle coating can dictate NM compatibility with the immune system. For example, NMs can be designed by attaching to polyethylene glycol (PEG) of other types of polymers to create a hydrophobic environment, thus shielding them from immune recognition (63). Although these polymers may shield NMs from most immune surveillance, some data suggest the formation of PEG-specific Abs (64, 65) and accelerated clearance of PEG liposomes from the blood, thus changing the pharmacokinetic profiles (66–68). Therefore, generation of NM-specific Abs may affect the efficacy and safety of NM-based therapeutics. In contrast, NMs can be designed to elicit an immune response by either direct activation of APCs or delivering Ag to specific cellular compartments (69). One of the most heavily researched areas in nanomedicine is NP-based drug delivery (70, 71). Although this research is producing effective reagents and making poorly soluble drugs useful through encapsulation, controlled release, and targeting, the NPs themselves are usually not therapeutic. In this final section, we briefly review the effects of AuNPs on immune function. As a result of their fairly simple preparation and functionalization with drugs or other ligands, unique optical properties, and tuneability with regard to a desired size or shape (72–74), AuNP-based immunotherapies have been a promising carrier for immune therapies in cancer Ag and immune adjuvant delivery (75–77), as well as in photothermal ablation and light-triggered drug delivery (78–80). However, because AuNPs can accumulate in the immune system and exhibit many toxic side effects, they should be used cautiously as a delivery system. As with other NMs, the size, shape, and electrical charge alter the recognition and uptake of AuNPs in both phagocytic and nonphagocytic cells. Interestingly, in nonphagocytic cells, positively charged AuNPs appear to be taken up to a much greater extent than negatively charged ones, whereas in phagocytic cells, particle charge has little effect on uptake. Furthermore, in nonphagocytic cells, AuNPs were taken up via clathrin-mediated endocytosis and localized to secondary lysosomes, whereas in phagocytic cells, AuNPs were taken up through phagocytosis and located in phagosomes (81). Later studies showed that phagocytosis of 30- versus 150-nm-diameter AuNPs occurred via different mechanisms (e.g., clathrin-mediated pinocytosis and scavenger receptor–mediated phagocytosis, respectively) (82). In vitro AuNPs induce proinflammatory cytokine expression in macrophages in a size-dependent manner (83). In contrast, other laboratories showed that AuNPs can inhibit IL-1β–mediated inflammatory responses and TLR9 responses, also in a size-dependent manner (84, 85). Although these studies also suggested that particles < 5 nm had the greatest impact on immune response, others determined that more hydrophobic ∼2-nm AuNPs exhibited the greatest expression of inflammatory cytokines by mouse splenocytes (86). Oligonucleotide-conjugated 13-nm AuNPs increased the expression of inflammatory and defense response genes as categorized by gene ontology analysis in human PBMCs, yet similar responses were not observed in the 293 T cell line (87), suggesting that assessing the immunotoxicity of AuNPs on immortalized cell lines, as opposed to primary cells, may yield differing results. Therefore, the immune response to AuNPs may be tissue and context dependent, as well as particle size and shape dependent. Finally, because AuNPs inevitably accumulate in high concentrations in the liver and spleen for extended periods of time (88, 89), it is important to better understand how AuNPs interact with the immune system before developing them as a therapeutic delivery platform. It appears that therapeutic AuNPs may be similar to chemotherapeutics’ double-edged sword because they can be therapeutic, yet they can also be toxic. Additionally, the differing results regarding the inflammatory or anti-inflammatory effects of AuNPs merit further consideration. Although the distribution and immune-modulatory activity of AuNPs in vivo may cause inflammatory or anti-inflammatory side effects, these properties might also be manipulated for therapeutic applications, such as vaccine and immune adjuvant delivery. These studies highlight the need to design NMs that do not adversely affect the biological systems where they will be used and demonstrate that it is crucial to simultaneously ascertain the therapeutic and toxic properties of any metal-containing NP. Nanotechnology has generated, and will continue to generate, a wide spectrum of novel NMs that will revolutionize many fields. Existing studies demonstrated that nanotechnology offers advantages over traditional medicines, such as improved stability, favorable biodistribution profiles, slower drug-release kinetics, lower immunotoxicity, and targeting to specific immune cell populations. However, it is essential to address the potential adverse health risks that NMs pose in occupational, medicinal, consumer, or environmental exposure settings because of their unpredictable chemical and biological nature. Immune reactions are a key concern for potential adverse effects of NMs. Although certain predictions can be made regarding the immunotoxicity of NMs, the unique nature of these structures make it difficult, if not impossible, to predict how some NMs will interact with intracellular structures, such as DNA, cell membranes, and cytoskeletal proteins. NMs exposure has not yet been linked to human disease because of the relatively recent emergence of nanotechnology and the lack of epidemiologic data. Thus, future research into NMs is highly relevant from a public health perspective, as well as for the novel insights that it will yield on the basic functions of the immune system. To develop novel and safe therapies that provide efficient protection against infectious diseases or immune-mediated diseases in children or those that develop during childhood, it is necessary to understand immune system ontogeny. Because immunological development is dependent on both genetic and environmental influences, investigations into both fields advance our understanding of immune function and provide the foundation for the development of novel immunotherapeutics. Notably, the generation of research tools, such as genetically altered animals and targeted gene modulation, has greatly enhanced our understanding of the impact that genetic abnormalities have on the developing immune system. However, over the last two decades, the effects of pollutants have been systematically evaluated, further adding to our understanding of how the environment affects the developing immune system. These studies revolve around two central tenets: the developing immune system may be more sensitive to environmental chemical exposures than the adult immune system, and the environment significantly impacts the developmental origins of health and disease. Disruption of the developing immune system by early-life environmental insults may not only adversely affect the health of the exposed offspring later in life, it potentially extends to additional generations through epigenetic changes. Therefore, uncovering the effects of environmental insults on the developing immune system is expected to benefit public health and provide novel insights into immune system ontogeny. The increased risk for injury to the developing immune system has been seen across several categories of drugs and chemicals, as well as heavy metals and mold toxins. Moreover, prenatal and early postnatal exposures are more likely to produce a broader array of immune parameters affected, and an increased risk for adverse immune outcomes persisting into later life (90). These differential immune effects can take many forms, which are briefly described below for a select few toxicants. Perhaps one of the more comprehensive datasets for developmental immunotoxicity exists for TCDD and TCDD-like chemicals. To this end, developmental exposure to AhR-activating chemicals, such as TCDD, perturbs immune cell development, resulting in attenuated hematopoietic stem cell (HSC) differentiation and long-term self-renewal (91). These effects can contribute to increased incidence of autoimmunity and decreased responsiveness to infectious pathogens, such as influenza A (92, 93). Furthermore, activation of AhR by TCDD induces epigenetic changes in lymphocytes, especially T cells, causing DNA hypermethylation and ultimately reducing CD8+ T cell antiviral immunity (94). Conversely, early life exposure to TCDD was recently demonstrated to enhance the CD4+ T cell response to viral infection in the lung; however, this response ultimately resulted in greater bronchopulmonary inflammation and, consequently, reduced antiviral immunity (95, 96). Additionally, the AhR signaling pathway plays a requisite role in the development and function of HSCs and progenitor cells; consequently, AhR-null mice possess abnormalities in these cellular populations (97–100). Moreover, recent reports described a critical usefulness for AhR antagonists (along with Notch ligand agonists) in the regulation and generation of HSCs from cord blood, providing significant advances for allograft transplantation (97, 101). Taken together, AhR is now recognized as a critical regulator of key cells in the developing immune system; consequently, a greater understanding of its effects will benefit the development of novel immunotherapies and result in improved human health. Exposure to other chemicals in the environment, such as pesticides, heavy metals, and endocrine disruptors, also impact the developing immune system. Several pesticides, including organochlorines (i.e., chlordane, DDT/DDE), organophosphates (i.e., diazinon), and carbamates (i.e., carbofuran), were reported to induce developmental immunotoxicity in rodents (102). Additionally, prenatal exposure of humans to DDE is associated with reduced levels of IgG and recurrent respiratory infections in infants (103, 104). These results are intriguing because of reports that DDE can also enhance allergic responses in infants via induction of Th2 cytokines (105) but not via modulation of IgE, IL-33, or TSLP (106). Exposure of the developing immune system to heavy metals, such as lead, a known developmental toxicant, can adversely affect the generation of innate immune cells, such as macrophages and DCs (107). Specifically, dysregulated macrophage and DC effector functions, including reduced phagocytosis, lysosomal activation, and excessive production of reactive oxygen species and other inflammatory mediators (i.e., TNF-α, PGE2), contribute to Th2-biased immune responses in lead-exposed animals (108–110), ultimately contributing to imbalanced and inappropriate immune responses that can be persistent and increase the risk for inflammatory disorders and disease later in life (107). Thus, these studies have advanced our understanding of ontogeny of the innate immune system and support the hypothesis that early life exposure to these environmental stressors can program the immune system for subsequent dysfunction. Lastly, endocrine disruptors, such as bisphenol A (BPA; found in plastics, food sources, and many other consumer products), can alter various physiological systems by interfering with the activity or production of hormones. As expected, exposure to these types of chemicals, which occurs at the highest levels in fetuses, infants, and children, is thought to adversely affect human development. It is not known whether these environmental chemicals adversely affect the developing immune system, although, very recently, this has been an area of intense investigation (111). For example, developmental exposure to BPA modulated innate immunity in adult offspring mice but did not impair the adaptive immune response to influenza A virus infection (112). Perinatal exposure to low doses of BPA rendered the neonatal immune system more susceptible to food intolerance (113), and prenatal, but not postnatal, BPA exposure can enhance the postnatal development of experimental allergic asthma (114). Because BPA was shown to induce epigenetic regulation (i.e., DNA methylation, microRNA expression, and histone acetylation) in reproductive tissues, it will be interesting to determine whether similar effects exist in the developing immune system that may consequently affect the generation of inflammatory or immune-mediated disease (115). At the least, it is expected that further research on the potential immunotoxic effects of BPA and other endocrine disruptors will help us to better understand how the immune system develops and is shaped by environmental insults. Disruption of the ordered process of immunological development by xenobiotics can generate several potential outcomes, including immune deficiency, deviation, or dysregulation. Although it is hypothesized that these effects manifest themselves during the course of development or maturation of an organism, it is also possible that immunotoxicity can be transgenerational, although additional studies are necessary to firmly establish this potential outcome. If confirmed, these long-term effects could have profound implications on the immune system and its ability to respond effectively to infectious pathogens and tumor cells or to regulate appropriately self-directed responses that underlie autoimmunity. However, it is expected that, with an increased understanding of immunological ontogeny, opportunities will develop for the generation of novel therapies to mitigate the effects of environmental stressors. Environmental immunology/immunotoxicology is a relatively new and vital area of investigation in the field of immunology. Understanding how anthropogenic toxicants and natural toxins affect the development, maintenance, and function of the immune system is critical for achieving optimal human health. Surprisingly perhaps, the U.S. Environmental Protection Agency is the only chemical regulatory agency to have specific immunotoxicity testing requirements, and these are primarily for assessing pesticides (116). In contrast, the pharmaceutical industry uses a weight-of-evidence approach that is only exercised for immunological evaluation if standard toxicological assays show cause for concern. Regardless, numerous examples exist demonstrating the potential adverse effects that exposure to environmental chemicals can and do have on the immune system. Although xenobiotic exposure can come from environmental, occupational, or recreational sources, this list of potential threats has expanded recently to include symbiotic microbial exposure. Thus, it is extremely valuable for public health to fully understand the impact that environmental chemicals have on the immune system, the mechanisms underlying these effects, and how they might be mitigated. Overall, environmental immunology has provided highly tangible benefits in the study of the immune system. To better understand how AhR regulates immune development and function, the use of chemicals, such as TCDD, has been invoked as environmental stressors, as well as biological probes. These studies have resulted in a greater understanding of the critical role of the AhR in HSCs, progenitor cells, and innate and adaptive immune cells. In the study of NMs, immunotoxicologists have been on the cutting-edge of discovery, identifying powerful biomedical uses and establishing necessary safety parameters for these xenobiotics. Experiments using NMs also yielded novel, fundamental insights into inflammatory processes, such as the generation and regulation of the inflammasome, as well as intracellular organelles (i.e., lysosomes, phagosomes) and their function (i.e., autophagy) in immune cells. Moreover, recent studies involving nanomedicines have ushered in a new era for discovery of biomedical probes and drug-delivery systems that have the potential to revolutionize medicine in the coming years. Lastly, experiments aimed at defining the effects of xenobiotics on the developing immune system are beginning to expand our understanding of immunological ontogeny. Previously unknown or unappreciated molecular regulators of immune cell/tissue development, such as AhR signaling modulators (both agonists and antagonists), environmental pollutants (i.e., TCDD, PCBs) that induce epigenetic modifications, and endocrine disruption by xenoestrogens (i.e., BPA), are expected to enhance public health, as well as spur development of novel immunotherapeutics designed to improve childhood health. In this manner, environmental immunology provides innovation at the intersection of immunology and the environment in which we live. This work was supported by National Institute of Environmental Health Sciences/National Institute of General Medical Sciences Grant ES013784 and National Institute of Environmental Health Sciences Grant ES025386 (both to D.M.S.) and by National Institute of General Medical Sciences Grant GM103546 (to C.A.B.).
. 1970. Genetic differences in the extent of aryl hydrocarbon hydroxylase induction in mouse fetal cell cultures. J. Biol. Chem. 245: 6373–6382. 2007. An aryl hydrocarbon receptor odyssey to the shores of toxicology: the Deichmann Lecture, International Congress of Toxicology-XI. Toxicol. Sci. 98: 5–38.
. 1976. Stereospecific, high affinity binding of 2,3,7,8-tetrachlorodibenzo-p-dioxin by hepatic cytosol. Evidence that the binding species is receptor for induction of aryl hydrocarbon hydroxylase. J. Biol. Chem. 251: 4936–4946.
. 1974. Aryl hydrocarbon hydroxylase induction in human lymphocyte cultures by 2,3,7,8-tetrachlorodibenzo-p-dioxin. Life Sci. 15: 1585–1595.
. 1984. Ontogeny of the cytosolic receptor for 2,3,7,8-tetrachlorodibenzo-p-dioxin in rat liver, lung, and thymus. Biochem. Biophys. Res. Commun. 118: 183–190.
. 1985. Relationship between Ah receptor-mediated polychlorinated biphenyl (PCB)-induced humoral immunosuppression and thymic atrophy. J. Pharmacol. Exp. Ther. 235: 606–611.
. 1984. Correlations between polychlorinated biphenyl immunotoxicity, the aromatic hydrocarbon locus, and liver microsomal enzyme induction in C57BL/6 and DBA/2 mice. Toxicol. Appl. Pharmacol. 75: 156–165.
. 1986. Ah receptor mediated suppression of the antibody response in mice is primarily dependent on the Ah phenotype of lymphoid tissue. Toxicol. Appl. Pharmacol. 86: 380–390.
. 1988. Effects of the TCDD congeners 3,3′,4,4′-tetrachlorobiphenyl and 3,3′,4,4′-tetrachloroazoxybenzene on lymphoid development in the bursa of Fabricius of the chick embryo. Toxicol. Appl. Pharmacol. 92: 315–323.
. 2014. The aryl hydrocarbon receptor: multitasking in the immune system. Annu. Rev. Immunol. 32: 403–432.
. 2015. The aryl hydrocarbon receptor in barrier organ physiology, immunology, and toxicology. Pharmacol. Rev. 67: 259–279.
. 2007. Microarray analysis of the AHR system: tissue-specific flexibility in signal and target genes. Toxicol. Appl. Pharmacol. 220: 320–332. 2009. AHR-mediated immunomodulation: the role of altered gene transcription. Biochem. Pharmacol. 77: 746–760. 2014. Toward understanding the role of aryl hydrocarbon receptor in the immune system: current progress and future trends. BioMed Res. Int. 2014: 520763. 2013. The relationship between environmental variables and response of cotton to nematicides. J. Nematol. 45: 8–16.
. 2011. External influences on the immune system via activation of the aryl hydrocarbon receptor. Semin. Immunol. 23: 99–105.
. 2011. Dietary ligands of the aryl hydrocarbon receptor induce anti-inflammatory and immunoregulatory effects on murine dendritic cells. Toxicol. Sci. 124: 327–338.
. 2010. Functional and phenotypic effects of AhR activation in inflammatory dendritic cells. Toxicol. Appl. Pharmacol. 246: 18–28.
. 2008. Functional characterization and gene expression analysis of CD4+ CD25+ regulatory T cells generated in mice treated with 2,3,7,8-tetrachlorodibenzo-p-dioxin. J. Immunol. 181: 2382–2391.
. 2010. An endogenous aryl hydrocarbon receptor ligand acts on dendritic cells and T cells to suppress experimental autoimmune encephalomyelitis. Proc. Natl. Acad. Sci. USA 107: 20768–20773.
. 2009. Aryl hydrocarbon receptor in combination with Stat1 regulates LPS-induced inflammatory responses. J. Exp. Med. 206: 2027–2035.
. 2006. Aryl hydrocarbon receptor- and calcium-dependent induction of the chemokine CCL1 by the environmental contaminant benzo[a]pyrene. J. Biol. Chem. 281: 19906–19915.
. 2015. Aryl Hydrocarbon Receptor Activation Synergistically Induces Lipopolysaccharide-Mediated Expression of Proinflammatory Chemokine (c-c motif) Ligand 20. Toxicol. Sci. 148: 229–240.
. 2009. Langerhans cell maturation and contact hypersensitivity are impaired in aryl hydrocarbon receptor-null mice. J. Immunol. 182: 6709–6717.
. 2009. Aryl hydrocarbon receptor activation inhibits in vitro differentiation of human monocytes and Langerhans dendritic cells. J. Immunol. 183: 66–74.
. 2003. Polycyclic aromatic hydrocarbons inhibit differentiation of human monocytes into macrophages. J. Immunol. 170: 2374–2381.
. 2009. A human natural killer cell subset provides an innate source of IL-22 for mucosal immunity. Nature 457: 722–725.
. 2010. Interleukin-1beta selectively expands and sustains interleukin-22+ immature human natural killer cells in secondary lymphoid tissue. Immunity 32: 803–814.
. 2013. Modulation of natural killer cell antitumor activity by the aryl hydrocarbon receptor. Proc. Natl. Acad. Sci. USA 110: 12391–12396.
. 2012. The aryl hydrocarbon receptor regulates gut immunity through modulation of innate lymphoid cells. Immunity 36: 92–104.
. 2015. Transcriptional regulation of innate lymphoid cell fate. Nat. Rev. Immunol. 15: 415–428.
. 2015. Aryl hydrocarbon receptor: Linking environment to immunity. Semin. Immunol. 27: 310–314.
. 2002. A ligand for the aryl hydrocarbon receptor isolated from lung. Proc. Natl. Acad. Sci. USA 99: 14694–14699.
. 2010. An interaction between kynurenine and the aryl hydrocarbon receptor can generate regulatory T cells. J. Immunol. 185: 3190–3198.
. 1995. Structure elucidation of two tryptophan-derived, high affinity Ah receptor ligands. Chem. Biol. 2: 841–845.
. 2013. Differential influences of the aryl hydrocarbon receptor on Th17 mediated responses in vitro and in vivo. PLoS One 8: e79819.
. 2014. Differential consequences of two distinct AhR ligands on innate and adaptive immune responses to influenza A virus. Toxicol. Sci. 137: 324–334.
. 2015. Aryl hydrocarbon receptor mediates both proinflammatory and anti-inflammatory effects in lipopolysaccharide-activated microglia. Glia 63: 1138–1154.
. 2012. Nanoparticle-mediated codelivery of myelin antigen and a tolerogenic small molecule suppresses experimental autoimmune encephalomyelitis. Proc. Natl. Acad. Sci. USA 109: 11270–11275.
. 2014. The aryl hydrocarbon receptor: differential contribution to T helper 17 and T cytotoxic 17 cell development. PLoS One 9: e106955.
. 2006. The potential risks of nanomaterials: a review carried out for ECETOC. Part. Fibre Toxicol. 3: 11.
. 2012. 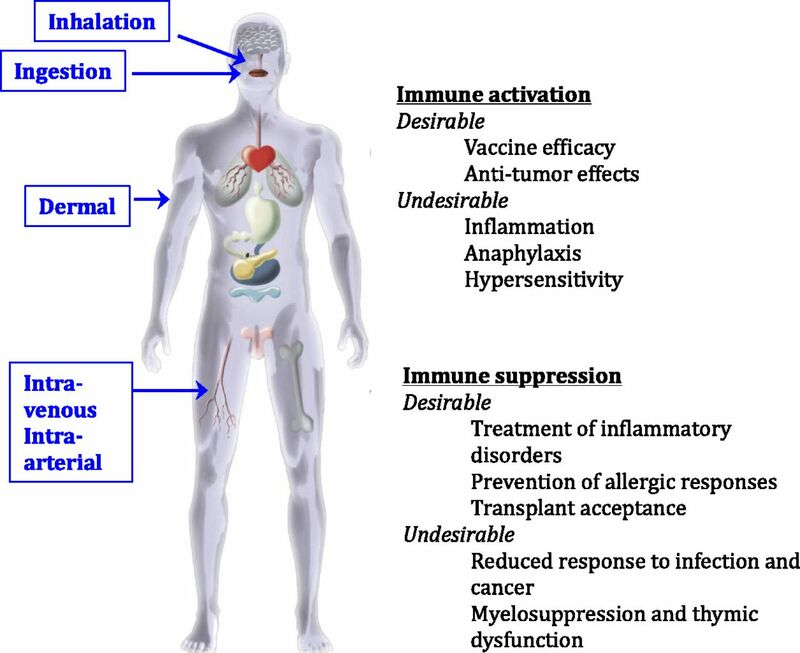 Health impact and toxicological effects of nanomaterials in the lung. Respirology 17: 743–758.
. 2013. Distribution and fibrotic response following inhalation exposure to multi-walled carbon nanotubes. Part. Fibre Toxicol. 10: 33.
. 2014. Pulmonary toxicity of nanomaterials: a critical comparison of published in vitro assays and in vivo inhalation or instillation studies. Nanomedicine (Lond.) 9: 2557–2585.
. 2013. IL-33 mediates multi-walled carbon nanotube (MWCNT)-induced airway hyper-reactivity via the mobilization of innate helper cells in the lung. Nanotoxicology 7: 1070–1081.
. 2014. IL-1R signalling is critical for regulation of multi-walled carbon nanotubes-induced acute lung inflammation in C57Bl/6 mice. Nanotoxicology 8: 17–27.
. 2015. Endocytosis of Multiwalled Carbon Nanotubes in Bronchial Epithelial and Mesothelial Cells. BioMed Res. Int. 2015: 793186.
. 2015. Implications of scavenger receptors in the safe development of nanotherapeutics. Receptors Clin. Investig. 2: e811.
. 2008. Multi-walled carbon nanotubes injure the plasma membrane of macrophages. Toxicol. Appl. Pharmacol. 232: 244–251.
. 2009. Particle length-dependent titanium dioxide nanomaterials toxicity and bioactivity. Part. Fibre Toxicol. 6: 35.
. 2006. Toxic potential of materials at the nanolevel. Science 311: 622–627.
. 2012. The mechanism of pleural inflammation by long carbon nanotubes: interaction of long fibres with macrophages stimulates them to amplify pro-inflammatory responses in mesothelial cells. Part. Fibre Toxicol. 9: 8.
. 2013. Acute pulmonary dose-responses to inhaled multi-walled carbon nanotubes. Nanotoxicology 7: 1179–1194.
. 2011. Long, needle-like carbon nanotubes and asbestos activate the NLRP3 inflammasome through a similar mechanism. ACS Nano 5: 6861–6870.
. 2009. The inflammasomes: guardians of the body. Annu. Rev. Immunol. 27: 229–265.
. 2013. Culture medium type affects endocytosis of multi-walled carbon nanotubes in BEAS-2B cells and subsequent biological response. Toxicol. In Vitro 27: 1679–1685.
. 2013. Single-walled carbon nanotubes and graphene oxides induce autophagosome accumulation and lysosome impairment in primarily cultured murine peritoneal macrophages. Toxicol. Lett. 221: 118–127.
. 2014. Interference in autophagosome fusion by rare earth nanoparticles disrupts autophagic flux and regulation of an interleukin-1β producing inflammasome. ACS Nano 8: 10280–10292.
. 2006. Quantum dots for human mesenchymal stem cells labeling. A size-dependent autophagy activation. Nano Lett. 6: 2826–2832.
. 2012. Tuning the autophagy-inducing activity of lanthanide-based nanocrystals through specific surface-coating peptides. Nat. Mater. 11: 817–826.
. 2014. Tuning cell autophagy by diversifying carbon nanotube surface chemistry. ACS Nano 8: 2087–2099. 2002. Chemical camouflage of nanospheres with a poorly reactive surface: towards development of stealth and target-specific nanocarriers. Biochim. Biophys. Acta 1590: 131–139.
. 2007. PEGylated liposomes elicit an anti-PEG IgM response in a T cell-independent manner. J. Control. Release 122: 349–355.
. 2007. Anti-PEG IgM elicited by injection of liposomes is involved in the enhanced blood clearance of a subsequent dose of PEGylated liposomes. J. Control. Release 119: 236–244.
. 2006. Accelerated blood clearance of PEGylated liposomes upon repeated injections: effect of doxorubicin-encapsulation and high-dose first injection. J. Control. Release 115: 251–258.
. 2006. Injection of PEGylated liposomes in rats elicits PEG-specific IgM, which is responsible for rapid elimination of a second dose of PEGylated liposomes. J. Control. Release 112: 15–25.
. 2008. Accelerated blood clearance (ABC) phenomenon upon repeated injection of PEGylated liposomes. Int. J. Pharm. 354: 56–62.
. 2006. Methods for nano-particle based vaccine formulation and evaluation of their immunogenicity. Methods 40: 20–29.
. 2015. Therapeutic gold, silver, and platinum nanoparticles. Wiley Interdiscip. Rev. Nanomed. Nanobiotechnol. 7: 428–445.
. 2012. Engineering nano- and microparticles to tune immunity. Adv. Mater. 24: 3724–3746.
. 2015. Off to the organelles - killing cancer cells with targeted gold nanoparticles. Theranostics 5: 357–370.
. 2011. Biodistribution and toxicity of engineered gold nanoparticles: a review of in vitro and in vivo studies. Chem. Soc. Rev. 40: 1647–1671.
. 2011. In vivo biodistribution of nanoparticles. Nanomedicine (Lond.) 6: 815–835.
. 2012. Imageable antigen-presenting gold nanoparticle vaccines for effective cancer immunotherapy in vivo. Angew. Chem. Int. Ed. Engl. 51: 8800–8805.
. 2013. Gold nanoparticle delivery of modified CpG stimulates macrophages and inhibits tumor growth for enhanced immunotherapy. PLoS One 8: e63550.
. 2010. Cellular response of polyvalent oligonucleotide-gold nanoparticle conjugates. ACS Nano 4: 5641–5646.
. 2010. Gold nanoparticles: opportunities and challenges in nanomedicine. Expert Opin. Drug Deliv. 7: 753–763.
. 2003. Nanoshell-mediated near-infrared thermal therapy of tumors under magnetic resonance guidance. Proc. Natl. Acad. Sci. USA 100: 13549–13554.
. 2007. Gold nanoparticles: interesting optical properties and recent applications in cancer diagnostics and therapy. Nanomedicine (Lond.) 2: 681–693.
. 2013. Surface and size effects on cell interaction of gold nanoparticles with both phagocytic and nonphagocytic cells. Langmuir 29: 9138–9148.
. 2011. Macrophage scavenger receptor A mediates the uptake of gold colloids by macrophages in vitro. Nanomedicine (Lond.) 6: 1175–1188.
. 2009. Cytotoxicity and immunological response of gold and silver nanoparticles of different sizes. Small 5: 1553–1561.
. 2013. Gold nanoparticles downregulate interleukin-1β-induced pro-inflammatory responses. Small 9: 472–477.
. 2012. Size-dependent attenuation of TLR9 signaling by gold nanoparticles in macrophages. J. Immunol. 188: 68–76.
. 2012. Nanoparticle hydrophobicity dictates immune response. J. Am. Chem. Soc. 134: 3965–3967.
. 2012. Gold nanoparticle-mediated gene delivery induces widespread changes in the expression of innate immunity genes. Gene Ther. 19: 347–353.
. 2009. Protracted elimination of gold nanoparticles from mouse liver. Nanomedicine (Lond.) 5: 162–169.
. 2010. Biodistribution of gold nanoparticles and gene expression changes in the liver and spleen after intravenous administration in rats. Biomaterials 31: 2034–2042. Dietert, R. R. 2014. Developmental Immunotoxicity, Perinatal Programming, and Noncommunicable Diseases: Focus on Human Studies. Adv. Med. 2014: 867805.
. 2014. Developmental exposure to 2,3,7,8 tetrachlorodibenzo-p-dioxin attenuates capacity of hematopoietic stem cells to undergo lymphocyte differentiation. Toxicol. Appl. Pharmacol. 277: 172–182.
. 2008. The aryl hydrocarbon receptor affects distinct tissue compartments during ontogeny of the immune system. Toxicol. Sci. 102: 160–170.
. 2015. Fetal Hematopoietic Stem Cells Are the Canaries in the Coal Mine That Portend Later Life Immune Deficiency. Endocrinology 156: 3458–3465.
. 2015. Linking the aryl hydrocarbon receptor with altered DNA methylation patterns and developmentally induced aberrant antiviral CD8+ T cell responses. J. Immunol. 194: 4446–4457.
. 2015. Developmental activation of the AHR increases effector CD4+ T cells and exacerbates symptoms in autoimmune disease-prone Gnaq+/− mice. Toxicol. Sci. 148: 555–566.
. 2015. Activation of the aryl hydrocarbon receptor during development enhances the pulmonary CD4+ T-cell response to viral infection. Am. J. Physiol. Lung Cell. Mol. Physiol. 309: L305–L313.
. 2010. Aryl hydrocarbon receptor antagonists promote the expansion of human hematopoietic stem cells. Science 329: 1345–1348.
. 2009. The aryl hydrocarbon receptor has a normal function in the regulation of hematopoietic and other stem/progenitor cell populations. Biochem. Pharmacol. 77: 577–587.
. 2011. Aryl hydrocarbon receptor-null allele mice have hematopoietic stem/progenitor cells with abnormal characteristics and functions. Stem Cells Dev. 20: 769–784.
. 2013. The aryl hydrocarbon receptor directs hematopoietic progenitor cell expansion and differentiation. Blood 122: 376–385.
. 2014. Cord blood expansion. Pyrimidoindole derivatives are agonists of human hematopoietic stem cell self-renewal. Science 345: 1509–1512. 1999. Prenatal immunotoxicant exposure and postnatal autoimmune disease. Environ. Health Perspect. 107(Suppl. 5): 687–691.
. 2006. The relationship between persistent organic pollutants in maternal and neonatal tissues and immune responses to allergens: A novel exploratory study. Chemosphere 63: 1304–1311.
. 2010. DDE in mothers’ blood during pregnancy and lower respiratory tract infections in their infants. Epidemiology 21: 729–735.
. 2013. Pesticide induced immunotoxicity in humans: a comprehensive review of the existing evidence. Toxicology 307: 123–135.
. 2015. Maternal exposure to metals and persistent pollutants and cord blood immune system biomarkers. Environ. Health 14: 52.
. 2011. Early life environment and developmental immunotoxicity in inflammatory dysfunction and disease. Toxicol. Environ. Chem. 93: 1463–1485.
. 2006. Lead and immune function. Crit. Rev. Toxicol. 36: 359–385.
. 2007. Lead effects on development and function of bone marrow-derived dendritic cells promote Th2 immune responses. Toxicol. Appl. Pharmacol. 222: 69–79.
. 1998. Differential effects of lead and cAMP on development and activities of Th1- and Th2-lymphocytes. Toxicol. Sci. 43: 172–185.
. 2013. Review: Endocrine disrupting chemicals and immune responses: a focus on bisphenol-A and its potential mechanisms. Mol. Immunol. 53: 421–430.
. 2012. Developmental exposure to bisphenol A modulates innate but not adaptive immune responses to influenza A virus infection. PLoS One 7: e38448.
. 2014. Food intolerance at adulthood after perinatal exposure to the endocrine disruptor bisphenol A. FASEB J. 28: 4893–4900.
. 2012. Fetal exposure to bisphenol A as a risk factor for the development of childhood asthma: an animal model study. Environ. Health 11: 8.
. 2015. Epigenetic Regulation of Non-Lymphoid Cells by Bisphenol A, a Model Endocrine Disrupter: Potential Implications for Immunoregulation. Front. Endocrinol. (Lausanne) 6: 91.
. 2014. Approaches and considerations for the assessment of immunotoxicity for environmental chemicals: a workshop summary. Regul. Toxicol. Pharmacol. 68: 96–107.